Availability: Please allow up to 2 weeks for shipping. Upgrade your S1000RR's rear suspension with the high-performance Ohlins. 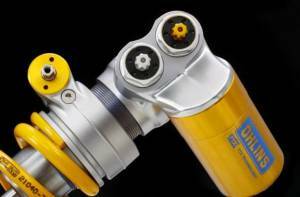 Shocks are setup to order by Ohlins in the USA. Enter your details below; weight with gear on and riding style. For 2018 Öhlins will be updating and revising the TTX GP product line-up. we have combined into the 2018 shock. or without tools compared to the current design. Please note: These shocks are ordered based on weight of the rider and upon a return in new condition, a restocking free will apply. Availability Remarks: Please allow up to 2 weeks for shipping.